I was reading an article about rejections, Dr Seuss, the beloved author of children’s picture books was rejected 27 times. Just before he lost all hope, an old friend agreed to publish it and it sold 600 million copies. Two things come to mind, one that success is difficult and you should never give up; secondly, the decision makers (editors, publishers etc.) need to find a different line of work. I have always been a writer and as a child I believed that one day I would see my works published. My educators seemed to doubt my supreme faith, luckily I was never one to blindly confirm. As a dyslexic I can understand their reluctance to envision me at some book-signing event. In retrospect, I must be the only dyslexic who wants to be a writer and loves words; I mean they rarely stay still. However, blessed with an overactive imagination it’s hard not to pen the echoes of strange worlds and capture the spirit of the glorious characters that abound in them. Dyslexia is why you have spell check, and why you enlist the help of friends and family to edit and proof read, not a reason to give up your passion. For those who have been following my blog, you would agree that my take on life is anything but stereotyped. Some see a glass half full, while others lament a glass half empty, I however rejoice on the glass fulfilling its role and the fact that my thirst can be quenched. My biggest grouse is with the naysayers of life, the judges, the evaluators, the critics etc. we all cross paths with them eventually to get the joy sucked out of our lives. These qualified analysts claim to have God’s ear, and hence the supreme confidence with which they declare you not fit, not good enough, not appropriate, will never succeed, will never amount to anything in life etc. They are predictable and spend their lives demanding that we, the free-spirited, conform to their rules and reasoning. How do you pigeonhole creativity, passion, and talent? “Too different and silly” the unanimous reason for rejection is what makes the books of Dr. Suess so loved. How many stories have we heard, of successful entrepreneurs who disagreed with the experts only to start their own common sense line that took them laughing to their banks? What we need is a little bit of Edison in our lives, ‘I haven’t failed 500 times but I have found 500 ways that don’t work’, this is how I remember the quote from childhood but today Google reports it as 10,000 times. The moral of the story still holds true, never give up and don’t listen to the naysayers. Rejections are the hallmark of the greatest achievers; the one commonality being they never accepted it. Previous Makeup is a woman’s right not a gender privilege. I got rejected in a job interview today. This was my dream company and I always wanted to get into this company. It’s not for me I guess. But now I feel I am incapable to get any job and I will get stuck in this company . Don’t get bogged down with life, believe in yourself, there is only one of you. Antonia, I totally love this post and I absolutely need this encouragement right now. I am looking for a new career opportunity in a very limited time. So stressful! But I don’t want to give it up and I cannot give it up. I do have bad days all the time. I still keep trying my best! I always believe I just a couple of steps away from the success. Thanks for liking my post! Lovely spring flowers, right? You are right, you are only a few steps away form success! Keep at it! Don’t worry about mistakes or missed opportunities, life allows U turns and many other possibilities. Get adventurous, life life on your terms. God bless! Love lilac, love spring, love flowers! Thank you Antonia! I will be brave and strong. Challenge makes my life rich and beautiful. Now I just noticed that I spelled Lilac wrong. haha. Oh. Please don’t tell anybody 😛 Enjoy the nice weather!!! Great post – thanks for sharing it in Blog Billion! Another inspirational post, Antonia. Yes, rejection is a stepping stone to great things. In the literary world especially, most writers have gone through this state but have emerged as bestsellers. In other spheres of human endeavour, rejection abounds as well. How we tackle it determines how far we are willing to go. This topic leads me to question who indeed has the power to judge or decide in the strictest sense of it all? No one. We are the true masters of our own destiny! Far too often we give other people the right to dictate our fate; if only we realise that we have the power to change our past, live our present and dictate our future, the shackles that bind us and keep us from claiming out destiny will be broken. 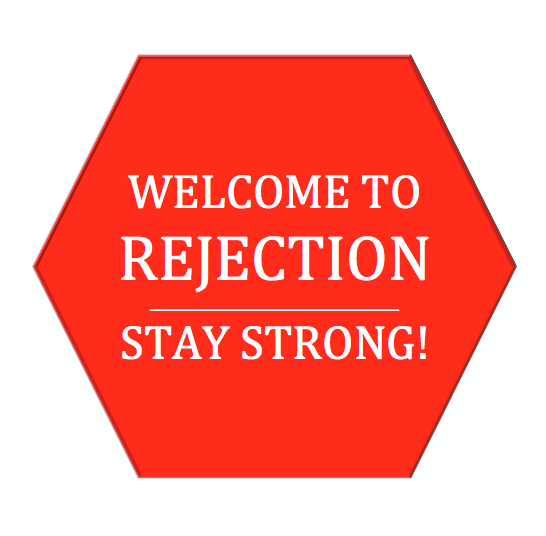 Rejections are the signposts that indicate that we are on our way to success. I need this way of thinking….last days were awful! great post! Doing my bit one post at a time, to help everyone realise that we are all winners. Some hit the jackpot early and some right at the end.